Florida has hundreds of wonderful water slides. Being the epicenter of the amusement park industry, there are many exciting water parks in Florida to choose from. With warm, beautiful weather every day of the year, Florida offers a plethora of fantastic parks to cool off at and enjoy some entertainment. There are many amazing tourist destinations throughout the state. Florida is a perpetual paradise with exceptional scenery. Florida is one of the most popular states for vacationers because of the amazing natural beauty, wonderful weather, and the extensive theme park infrastructure. Though Florida is perhaps best known as being home to Disney World, there are many spectacular water parks throughout the state. From calm waters amid majestic scenery, to wild aquatic thrill rides like no other oasis on earth, Florida certainly has something to offer everyone. Adventure Island: From the Endless Surf wave pool, to the amazing Wahoo Run rafting thrill ride, Adventure Island is full of excitement. Located right next door to Busch Gardens in Tampa, Adventure Island offers 30 acres of high speed enticement. Cliff jumping, wave machines and waterfalls await you. There is also a water playground for the children, so all members of the family will be able to enjoy an afternoon on Adventure Island. Busch Gardens Tampa Bay:Busch Gardens is one of the most famous water parks In Florida. It is also one of the favorites for many families. With rides, animals, live entertainment, and delicious dining, Busch Gardens has been attracting people for ages. Rapids Water Park: Rapids Water Park is an aquatic treasure situated in West Palm Beach. With 29 waterslides and 22 acres of activities, the attractions range from the wild to the mild. Rapids Water Park features Big Thunder, the largest water thrill ride in the entire state of Florida. Young children and older thrill seekers can enjoy the park together. Boomers: Boomers is located in Boca Raton and Fort Lauderdale. This is a wonderful park for young children, and the perfect spot to celebrate birthdays. Boomers features many fun activities such as laser tag, batting cages, game room, miniature golf, go karts, bumper boats and bowling. Boomers is not the greatest park for those searching for high paced thrill rides, but it's a spectacular park for children. Splash Island Water Park:Splash Island is part of Cypress Gardens and offers many amazing thrill rides. Attractions include the Polynesia Adventure, VooDoo Plunge and Tonga Tubes. Full of climbing ladders and exciting slides, Splash Island is located in Winter Haven, about halfway between Tampa and Orlando. Adventure Landing offers Shipwreck Island, a northern Florida water park located in Jacksonville, Jacksonville Beach, and St. Augustine. A new two-person waterslide known as the Undertow allows two riders to share the same raft. Aquatica: Aquatica is Sea World's water park. Attractions include animals, fabulous thrill rides, and an amazing infrastructure of attractions for all ages. Aquatica is located in Orlando. 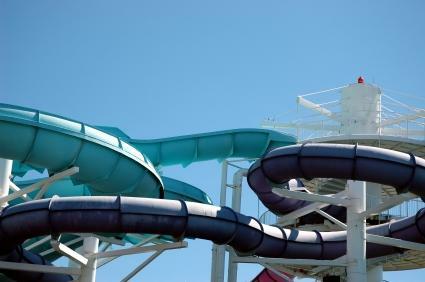 Big Kahunas: With over 40 attractions, Big Kahunas is a popular water park that features many slides and thrill rides. The Honolulu Half Pipe is one of the fun new attractions. There are a variety of slides designed for young children to safely enjoy a thrill. Big Kahunas is located in Destin, about halfway between Pensacola and Panama City. Wet n' Wild: Wet n' Wild prides itself on being the recognized name in family fun. The Orlando water park offers numerous thrill rides and multiple person rides. Wet n' Wild has a great reputation for providing family fun. Blizzard Beach and Typhoon Lagoon: These Disney water parks offer amazing entertainment for the whole family. From Cross Country Creek to the Downhill Double Dipper, Disney delivers fun entertainment for the entire family to enjoy and remember forever.